There was a moment, where I was unhappy with the way my life was unfolding. I felt that there was a part of me that had not come to surface and I was not in touch with my true nature. I found that I was not true to myself. This led me on a journey of how to discover and activate happiness as a living reality. Where was I to begin? The only place that made sense to me was to look at my life situation. This journey of truth began for me when I started to look at what I responded to in my life. My thoughts and feelings were random, where I had no control. I started to realize that a bad habit of solving my problems was engaging with my thoughts and feelings, trying to work them out, or worse … trying to change what I was experiencing. It seemed that the more I focussed on what I didn’t like, the more I got of it! Where did I have a choice in my life? There was no solution and my problems compounded. I was never really happy! How to move forward with a reasonable happy life? I was unable to separate from my occurring reality, and it is impossible to change my occurring reality. What I am aware of and awareness itself are one. They are a co-arising reality. I realized that treating my occurring reality as a separate reality was the root cause of the persistence of my problems and to a large degree contributed to my ineffectiveness. My only way to move forward was from a place that honored the co-arising aspect of what I was experiencing. If I wanted to have the experience of happiness, then the place to start was not focussing on the content of my life, but on being happy first! The “problem” of happiness is the “problem” of consciousness. Consciousness is not some linear reality that one can grasp. The problem of trying to grasp the phenomenon of consciousness is that the same agent making the effort to grab it, is an integral part of it. It is only in rare moments of direct experience that you grab the true nature of consciousness. The solution simultaneously presented a new way of looking at the question, “what is happiness?’ Grasping the true nature of consciousness gives you a new way approach to the problem of happiness. It actually creates the conditions allowing for happiness to become a living reality in your life. The true nature of consciousness is that it is a co-arising phenomenon. It is that what you are aware of and awareness itself are a co-arising reality. They are one. If you were treating them separately – which what we do in our daily lives – then you are in for a host of problems that in your efforts to bring solutions to, only creates new problems, more often creating a wheel of suffering that is difficult to escape. This profound insight sets the knowledge of what we know about ourselves and life of the last 2,500 years. Points that we have been demonstrating, been inquiring and developing our language of life – the way we talk about things – in the wrong way. We just did not know that we did not know. You are not separate from your experience. When you strive for happiness and accumulate the circumstances that you think will make you feel better, you unwittingly sabotage yourself at a fundamental level of your experience, of your being, hence creating a funnel of misery. You will make unwise decisions, spending too much money, ending relationships that are supposed to last. You are building up a life reacting to your circumstances. It should be manifesting your life according to your true intentions. One can only impact what is occurring for you at the level of a co-arising reality. Treating your occurring reality as a separate reality is the root cause of all of our ineffectiveness and to a large degree a contribution to our suffering. Inadvertently, we do this through misunderstanding of our true nature of consciousness. When you stop treating your occurring reality as a separate reality, or as something that you can change or modify to your liking – you let it be in other words – you will see the truth of what is, which is where your true power lies. You will recognize the truth of who you are. You will have a clearer vision. You will be in a place that you have an impact according to your true intentions. Once recognized the futility of trying to solve my problems to discover feeling happy, I made a commitment to being happy, content and satisfied. No matter what the circumstances of my life were, it displaced my default reality of doom and gloom. The Choice initiates another dynamic that brings you in another space. You no longer work your problems out. The Choice displaces stuff and allows you to see things from a new perspective. You are standing upon what you have created as a real presence in your life. Making The Choice calls up a presence awareness that shines light on eight facets. Each of these facets of being lets you discern a unique awareness presence which together with the initial presence awareness that you created, builds a co-arising reality of happiness. Making The Choice evokes a co-arising dynamic of presence awareness and awareness presence of happiness that is in keeping with the true nature of consciousness. This new awareness gives you a greater sense of freedom. You feel lighter in your being and with that, enter into a space where true happiness becomes available to you. 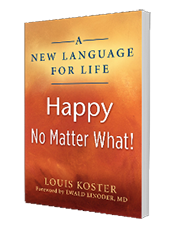 It is possible to make happiness a “living reality.” It is the power of awareness from a starting point that is in keeping what you probably would like to accomplish: an experience of abiding and enduring peace and happiness. A daily commitment will bring forth a space of happiness as a living reality. It is in this space of your daily commitment that you will find peace and harmony in your life. You will witness in a period of a few weeks that there will be a shift. You either make yourself miserable, or unhappy. The amount of work is the same. Activating The Choice as a daily commitment, you activate happiness as a living reality.